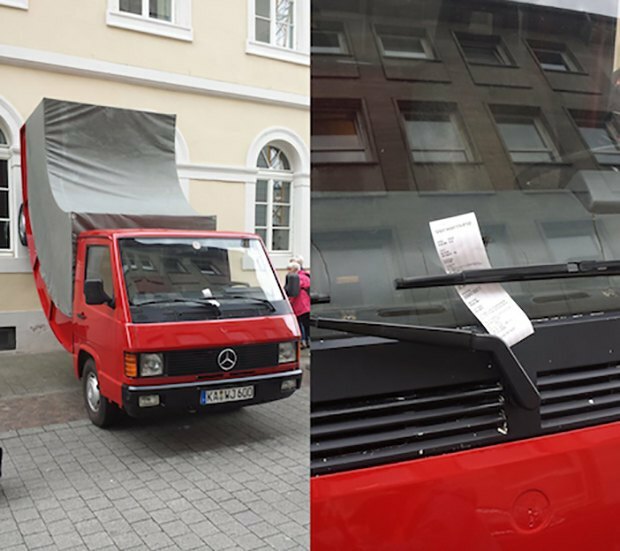 Austrian artist Erwin Wurm has received a parking ticket on his installation in Karlsruhe, Germany. The work features a MB100D truck facing away from a wall with a curved back end lying vertically. The piece is called Truck and is situated on the Karlsruhe Weinbrenner house, adjacent to the Center for Art and Media (ZKM). The truck is unfortunately parked in a restricted zone, which led an officer to issue a 30 Euro penalty. The city says it will try to fix the ticket, and the truck may remain where it is. Truck was created as part of the 300th birthday celebration of the city of Karlsruhe, and the artist says its form is intended to "show the everyday from a different perspective."